For other uses, see Unidentified flying object (disambiguation). "ufo" redirects here. For the genus of gall-wasps, see Ufo (genus). 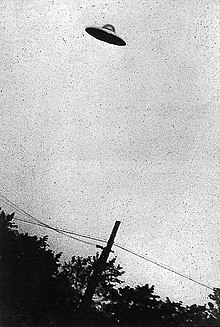 Photograph of an alleged UFO in Passaic, New Jersey, taken on July 31, 1952. The phrase "flying saucer" had gained widespread attention after the summer of 1947. On June 24, a civilian pilot named Kenneth Arnold reported seeing nine objects flying in formation near Mount Rainier. Arnold timed the sighting and estimated the speed of discs to be over 1,200 mph (1,931 km/h). At the time, he claimed he described the objects flying in a saucer-like fashion, leading to newspaper accounts of "flying saucers" and "flying discs". Ufo's were commonly referred to colloquially, as a "Bogey" by military personal and pilots during the cold war. The term "bogey" was originally used to report anomalies in radar blips, to indicate possible hostile forces that might be roaming in the area. Studies have established that the majority of UFO observations are misidentified conventional objects or natural phenomena—most commonly aircraft, balloons, noctilucent clouds, nacreous clouds, or astronomical objects such as meteors or bright planets with a small percentage even being hoaxes. [note 1] Between 5% and 20% of reported sightings are not explained, and therefore can be classified as unidentified in the strictest sense. While proponents of the extraterrestrial hypothesis (ETH) suggest that these unexplained reports are of alien spacecraft, the null hypothesis cannot be excluded that these reports are simply other more prosaic phenomena that cannot be identified due to lack of complete information or due to the necessary subjectivity of the reports. Instead of accepting the null hypothesis, UFO enthusiasts tend to engage in special pleading by offering outlandish, untested explanations for the validity of the ETH. These violate Occam's razor. The void left by the lack of institutional or scientific study has given rise to independent researchers and fringe groups, including the National Investigations Committee on Aerial Phenomena (NICAP) in the mid-20th century and, more recently, the Mutual UFO Network (MUFON) and the Center for UFO Studies (CUFOS). The term "Ufology" is used to describe the collective efforts of those who study reports and associated evidence of unidentified flying objects. Unexplained aerial observations have been reported throughout history. Some were undoubtedly astronomical in nature: comets, bright meteors, one or more of the five planets that can be readily seen with the naked eye, planetary conjunctions, or atmospheric optical phenomena such as parhelia and lenticular clouds. An example is Halley's Comet, which was recorded first by Chinese astronomers in 240 BC and possibly as early as 467 BC. Such sightings throughout history often were treated as supernatural portents, angels, or other religious omens. Some current-day UFO researchers have noticed similarities between some religious symbols in medieval paintings and UFO reports though the canonical and symbolic character of such images is documented by art historians placing more conventional religious interpretations on such images. On April 14, 1561, residents of Nuremberg described the appearance of a large black triangular object. According to witnesses, there were also hundreds of spheres, cylinders and other odd-shaped objects that moved erratically overhead. On January 25, 1878, the Denison Daily News printed an article in which John Martin, a local farmer, had reported seeing a large, dark, circular object resembling a balloon flying "at wonderful speed." Martin, according to the newspaper account, said it appeared to be about the size of a saucer, one of the first uses of the word "saucer" in association with a UFO. On February 28, 1904, there was a sighting by three crew members on the USS Supply 300 miles (483 km) west of San Francisco, reported by Lieutenant Frank Schofield, later to become Commander-in-Chief of the Pacific Battle Fleet. Schofield wrote of three bright red meteors - one egg shaped and the other two round - that approached beneath the cloud layer, then "soared" above the clouds, departing after two to three minutes. The largest had an apparent size of about six Suns, he said. The three earliest known pilot UFO sightings, of 1,305 similar sightings catalogued by NARCAP, took place in 1916 and 1926. On January 31, 1916, a UK pilot near Rochford reported a row of lights, resembling lighted windows on a railway carriage, that rose and disappeared. In January 1926 a pilot reported six "flying manhole covers" between Wichita, Kansas, and Colorado Springs, Colorado. In late September 1926 an airmail pilot over Nevada said he had been forced to land by a huge, wingless, cylindrical object. The secret Advanced Aviation Threat Identification Program which was funded from 2007 to 2012. Following the large U.S. surge in sightings in June and early July 1947, on July 9, 1947, United States Army Air Forces (USAAF) intelligence, in cooperation with the FBI, began a formal investigation into selected sightings with characteristics that could not be immediately rationalized, such as Kenneth Arnold's. The USAAF used "all of its top scientists" to determine whether "such a phenomenon could, in fact, occur." The research was "being conducted with the thought that the flying objects might be a celestial phenomenon," or that "they might be a foreign body mechanically devised and controlled." Three weeks later in a preliminary defense estimate, the air force investigation decided that, "This 'flying saucer' situation is not all imaginary or seeing too much in some natural phenomenon. Something is really flying around." The Travis Walton abduction case (1975): The movie Fire in the Sky (1993) was based on this event, but greatly embellished the original account. Document on sighting of a UFO occurred on December 16, 1977, in the state of Bahia, Brazil. 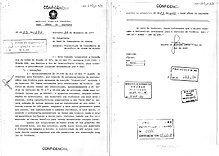 On October 31, 2008, the National Archives of Brazil began receiving from the Aeronautical Documentation and History Center part of the documentation of the Brazilian Air Force regarding the investigation of the appearance of UFOs in Brazil. Currently this collection gathers cases between 1952 and 2016. Italian ufologist Roberto Pinotti (it) with astrophysicist Josef Allen Hynek in 1981. Yet in 1978, there has been also the story of Pier Fortunato Zanfretta, the best known and most controversial case of an Italian alleged alien abduction. Zanfretta said (also with truth serum injected) to have been kidnapped by reptilian-like creatures on the night of 6 December and 7 December while he was performing his job at Marzano, in the municipality of Torriglia in the Province of Genoa; 52 testimonies of the case from other people were collected. In 2011, MUFON reported that UFO sightings referred to their offices had increased by 67% over the past three years as of June, 2011. According to MUFON international director Clifford Clift, "Over the past year, we've been averaging 500 sighting reports a month, compared to about 300 three years ago [67 percent],". According to the annual survey of reports conducted by Canadian-based UFO research group Ufology Research, reported UFO sightings doubled in Canada between 2011 and 2012. In 2013 the Peruvian government's Departamento de Investigación de Fenómenos Aéreos Anómalos (Anomalous Aerial Phenomena Research Department), or "DIFAA", was officially reactivated due to an increase in reported sightings. According to Colonel Julio Vucetich, head of the air force's aerospace interests division (who himself claims to have seen an "anomalous aerial object"), "On a personal basis, it's evident to me that we are not alone in this world or universe." In contrast, according to the UK-based Association for the Scientific Study of Anomalous Phenomena (ASSAP), reports of sightings in Britain to their office had declined by 96% from 1988 to 2012. An individual 1979 study by CUFOS researcher Allan Hendry found, as did other investigations, that only a small percentage of cases he investigated were hoaxes (<1 %) and that most sightings were actually honest misidentifications of prosaic phenomena. Hendry attributed most of these to inexperience or misperception. Since 2001 there have been calls for greater openness on the part of the government by various persons. In May 2001, a press conference was held at the National Press Club in Washington, D.C., by an organization called the Disclosure Project, featuring twenty persons including retired Air Force and FAA personnel, intelligence officers and an air traffic controller. They all gave a brief account of what they knew or had witnessed, and stated that they would be willing to testify to what they had said under oath to a Congressional committee. According to a 2002 report in the Oregon Daily Emerald, Disclosure Project founder Steven M. Greer has gathered 120 hours of testimony from various government officials on the topic of UFOs, including astronaut Gordon Cooper and a Brigadier General. In 2007, former Arizona governor Fife Symington came forward and belatedly claimed that he had seen "a massive, delta-shaped craft silently navigate over Squaw Peak, a mountain range in Phoenix, Arizona" in 1997. Apollo 14 astronaut Dr Edgar Mitchell claimed that he knew of senior government employees who had been involved in "close encounters" and because of this he has no doubt that aliens have visited Earth. Claims of physical trace of landing UFOs, including ground impressions, burned or desiccated soil, burned and broken foliage, magnetic anomalies[specify], increased radiation levels, and metallic traces. (See, e. g. Height 611 UFO incident or the 1964 Lonnie Zamora's Socorro, New Mexico encounter of the USAF Project Blue Book cases.) A well-known example from December 1980 was the USAF Rendlesham Forest incident in England. Another occurred in January 1981 in Trans-en-Provence and was investigated by GEPAN, then France's official government UFO-investigation agency. Project Blue Book head Edward J. Ruppelt described a classic 1952 CE2 case involving a patch of charred grass roots. One example is the response to local beliefs that "extraterrestrial beings" in UFOs were responsible for crop circles appearing in Indonesia, which the government and the National Institute of Aeronautics and Space (LAPAN) described as "man-made". Thomas Djamaluddin, research professor of astronomy and astrophysics at LAPAN stated: "We have come to agree that this 'thing' cannot be scientifically proven. Scientists have put UFOs in the category of pseudoscience." George Adamski, over the space of two decades, made various claims about his meetings with telepathic aliens from nearby planets. He claimed that photographs of the far side of the Moon taken by the Soviet lunar probe Luna 3 in 1959 were fake, and that there were cities, trees and snow-capped mountains on the far side of the Moon. Among copycats was a shadowy British figure named Cedric Allingham. Ed Walters, a building contractor, in 1987 allegedly perpetrated a hoax in Gulf Breeze, Florida. Walters claimed at first having seen a small UFO flying near his home and took some photographs of the craft. Walters reported and documented a series of UFO sightings over a period of three weeks and took several photographs. These sightings became famous, and are collectively referred to as the Gulf Breeze UFO incident. Three years later, in 1990, after the Walters family had moved, the new residents discovered a model of a UFO poorly hidden in the attic that bore an undeniable resemblance to the craft in Walters' photographs. Most investigators, like the forensic photo expert William G. Hyzer, now consider the sightings to be a hoax. UFOs have constituted a widespread international cultural phenomenon since the 1950s. Gallup Polls rank UFOs near the top of lists for subjects of widespread recognition. In 1973, a survey found that 95 percent of the public reported having heard of UFOs, whereas only 92 percent had heard of U.S. President Gerald Ford in a 1977 poll taken just nine months after he left the White House. A 1996 Gallup Poll reported that 71 percent of the United States population believed that the U.S. government was covering up information regarding UFOs. A 2002 Roper Poll for the Sci-Fi Channel found similar results, but with more people believing that UFOs are extraterrestrial craft. In that latest poll, 56 percent thought UFOs were real craft and 48 percent that aliens had visited the Earth. Again, about 70 percent felt the government was not sharing everything it knew about UFOs or extraterrestrial life. Another effect of the flying saucer type of UFO sightings has been Earth-made flying saucer craft in space fiction, for example the United Planets Cruiser C57D in Forbidden Planet (1956), the Jupiter 2 in Lost in Space, and the saucer section of the USS Enterprise in Star Trek, and many others. ^ For example, the USAF's Project Blue Book concluded that less than 2 % of reported UFOs were "psychological" or hoaxes; Allan Hendry's study for CUFOS had less than 1 %. ^ For example, current USAF general reporting procedures are in Air Force Instruction (AFI)10-206. Section 5.7.3 (p. 64) lists sightings of "unidentified flying objects" and "aircraft of unconventional design" as separate categories from potentially hostile but conventional, unidentified aircraft, missiles, surface vessels, or submarines. Additionally, "unidentified objects" detected by missile warning systems, creating a potential risk of nuclear war, are covered by Rule 5E (p.35). ^ Many of these documents are now online at the FOIA websites of these agencies such as the "FBI FOIA site". Archived from the original on May 24, 2008. Retrieved August 9, 2007. CS1 maint: BOT: original-url status unknown (link), as well as private websites such as The Black Vault, which has an archive of several thousand U.S. government UFO-related documents from the USAF, Army, CIA, DIA, DOD, and NSA. ^ The so-called Twining memo of Sept. 23, 1947, by future USAF Chief of Staff, General Nathan Twining, specifically recommended intelligence cooperation with the Army, Navy, Atomic Energy Commission, the Defense Department's Joint Research and Development Board, Air Force Scientific Advisory Board, National Advisory Committee for Aeronautics (NACA), Project RAND, and the Nuclear Energy for the Propulsion of Aircraft (NEPA) project. ^ Blumenthal, Ralph (April 24, 2017). "People Are Seeing U.F.O.s Everywhere, and This Book Proves It". New York Times. Retrieved April 24, 2017. ^ Costa, Cheryl; Costa, Linda Miller (March 24, 2017). "UFO Sightings Desk Reference: United States of America 2001-2015". Amazon. Retrieved April 24, 2017. ^ Ruppelt 1956, Chapter 1: "Project Blue Book and the UFO Story"
^ "UFO Part 1 of 16". The Vault. Washington, D.C.: Federal Bureau of Investigation. pp. 1–20. Retrieved 2013-05-16. ^ Aldrich, Lynn C. (July 14, 1947). "Unidentifiable objects, Williams Field; Chandler, Arizona" (Memorandum). Project Blue Book Archive. NARA-PBB1-922. Archived from the original on September 28, 2013. Retrieved May 16, 2013. ^ a b c Contreras, Russell (March 29, 2013). "FBI 'flying saucers' NM memo bureau's most viewed". Associated Press. Retrieved 2013-04-01. ^ Garber, Megan. "The Man Who Introduced the World to Flying Saucers". The Atlantic. Retrieved 2017-02-02. ^ "Saturday Night Uforia Audioplex: Edward R. Murrow - The Case ForOf The Flying Saucer (April 7, 1950 broadcast)". www.saturdaynightuforia.com. Retrieved 2017-02-02. ^ Roe, Ted. "On The Radar". NARCAP.org. National Aviation Reporting Center on Anomalous Phenomena (NARCAP). Archived from the original on 2011-07-27. Retrieved 2013-09-06. See May 17, 2013, NARCAP.org news release: "'Aliens', 'Alien Spaceships' & Government Coverups" on Facebook. ^ Novella, Steven, et al. The Skeptics' Guide to the Universe: How to Know What's Really Real in a World Increasingly Full of Fake. Grand Central Publishing, 2018. pp. 160. ^ a b Cross, Anne (March 2004). "The Flexibility of Scientific Rhetoric: A Case Study of UFO Researchers". Qualitative Sociology. Springer. 27 (1): 3–34. doi:10.1023/B:QUAS.0000015542.28438.41. ISSN 0162-0436. ^ a b McDonald, James E. (July 29, 1968). "Statement on Unidentified Flying Objects: Submitted to the House Committee on Science and Astronautics at July 29, 1968, Symposium on Unidentified Flying Objects, Rayburn Bldg., Washington, D.C., by James E. McDonald" (PDF). Retrieved 2013-09-06. ^ a b c "COMETA Report". Seattle, WA: ufoevidence.org. Retrieved 2013-07-13. ^ Salisbury, David F. (July 1, 1998). "UFO study causes media sensation: 7/1/98". Stanford Report. Stanford, CA: Stanford University. Retrieved 2013-05-16. ^ Hough, Andrew (April 13, 2010). "UFO studies should be 'legitimate university subject', claims American professor". The Daily Telegraph. London: Telegraph Media Group. Retrieved 2013-07-13. ^ Siddique, Haroon (2017-12-17). "Pentagon admits running secret UFO investigation for five years". the Guardian. Retrieved 2018-03-21. ^ Eghigian, Greg. "That Secret Government Program to Track UFOs? It's Not the First". Air & Space Magazine. Retrieved 2018-03-21. ^ "Mutual UFO Network". MUFON.com. Cincinnati, OH: Mutual UFO Network, Inc. Retrieved 2013-07-13. ^ "Center for UFO Studies". CUFOS.org. Chicago: Center for UFO Studies. Retrieved 2013-07-13. ^ Speigel, Lee (August 26, 2011). "UFO Sightings Increase 67 Percent In 3 Years, History Channel Investigates Unexplained Aerial Phenomena". The Huffington Post. AOL. Retrieved 2013-07-13. ^ Giordano, Daniela (November 13, 2006). "Do UFOs Exist in the History of Arts?". American Chronicle. Ultio, LLC. Archived from the original on 2012-08-19. Retrieved 2013-09-06. ^ Cuoghi, Diego (2004). "The Art of Imagining UFOs". Skeptic. The Skeptics Society. 11 (1). Retrieved 2013-09-06. ^ Vallee, Jacques; Aubeck, Chris (2010). Wonders in the Sky: Unexplained Aerial Objects from Antiquity to Modern Times. Tarcher. ISBN 1585428205. ^ Booth, B J (December 8, 2008). "Before the Wright Brothers ... There Were UFOs". American Chronicle. Ultio, LLC. Archived from the original on 2012-08-19. Retrieved 2013-09-06. ^ "Navy Officer Sees Meteors: They Were Red Ones, the Largest About Six Suns Big" (PDF). The New York Times. March 9, 1904. Retrieved 2013-09-06. ^ "Saw Big Meteors: The Largest Had an Apparent Area of About Six Suns". Richland Shield and Banner. Mansfield, OH. March 10, 1904. p. 1. Retrieved 2013-09-06. ^ Roerich, Nicholas (2001) [Originally published 1929; New York: Frederick A. Stokes Company]. Altai-Himalaya: A Travel Diary. Kempton, IL: Adventures Unlimited Press. pp. 361–362. ISBN 0-932813-93-3. LCCN 29011922. OCLC 50196530. ^ Roerich, Nicholas (1990) [Originally published 1930; New York: Frederick A. Stokes Company]. Shambhala: In Search of the New Era. Frontispiece in colors by Svetoslav Roerich. Rochester, VT: Inner Traditions International, Ltd. pp. 6–7, 244. ISBN 0-89281-305-9. LCCN 30009209. OCLC 21332745. ^ "Foo-Fighter". Time. January 15, 1945. Retrieved 2013-05-16. ^ "Project Blue Book Special Report #14". Internet Archive. United States Air Force. Retrieved 2013-09-07. ^ "Introductory Space Science". CUFON.org. West Jacksonville, FL: Computer UFO Network (CUFON). Retrieved 2013-05-16. Air Force Academy UFO material. ^ a b "AFD-070703-004.pdf" (PDF). Air Force Freedom of Information Act. United States Air Force. Archived from the original (PDF) on September 10, 2012. Retrieved September 7, 2013. ^ Sagan, Carl (1995). The Demon-Haunted World: Science as a Candle in the Dark (1st ed.). New York: Random House. ISBN 0-394-53512-X. LCCN 95034076. OCLC 779687822. ^ Cooper, Helene; Blumenthal, Ralph; Kean, Lesie (December 16, 2017). "Glowing Auras and 'Black Money': The Pentagon's Mysterious U.F.O. Program". The New York Times. Retrieved December 16, 2017. ^ a b c Larson, Phil (November 5, 2011). "Searching for ET, But No Evidence Yet". White House. Archived from the original on November 24, 2011. Retrieved September 6, 2013. ^ a b c Atkinson, Nancy (November 5, 2011). "No Alien Visits or UFO Coverups, White House Says". Universe Today. Courtenay, B.C. Retrieved 2011-11-06. ^ "Federal Bureau of Investigation FOIA Documents - Unidentified Flying Objects". Project Gutenberg. Retrieved 2013-09-07. Internal FBI memo from E. G. Fitch to D. M. Ladd concerning a request by General George F. Schulgen, Chief of the Requirements Intelligence Branch of Army Air Corps Intelligence, for the FBI to help with their investigation of UFO reports. ^ Ruppelt 1956, Chapter 3: "The Classics"
^ Haines, Gerald K. (1997). "CIA's Role in the Study of UFOs, 1947–90". Central Intelligence Agency. OCLC 713270503. Retrieved 2013-07-13. ^ McDonald, James E. (1974) [Originally published 1972]. "Science in Default: Twenty-Two Years of Inadequate UFO Investigations". In Sagan, Carl; Page, Thornton. UFO's: A Scientific Debate. American Association for the Advancement of Science, 134th Meeting (Reprint ed.). New York: W. W. Norton & Company. ISBN 978-0-393-00739-8. LCCN 72004572. OCLC 934695. Archived from the original on July 16, 2011. Retrieved March 30, 2011. ^ "Brazil to record UFO sightings". BBC News. 2010-08-12. Retrieved 2018-04-01. ^ "Canada's UFOs: The Search for the Unknown" (Virtual museum). Ottawa: Library and Archives Canada. Archived from the original on January 16, 2016. Retrieved September 8, 2013. ^ a b "GEIPAN: Le GEIPAN". Groupe d'Études et d'Informations sur les Phénomènes Aérospatiaux Non Identifiés (GEIPAN). Paris: Centre national d'études spatiales (CNES). Retrieved 2013-05-16. ^ "A history of UAP research at CNES". CNES. Retrieved October 6, 2014. ^ "English translation of GEIPAN FAQ". Retrieved October 6, 2014. ^ "Official French Gov't UFO study project to resume with new director". Seattle, WA: ufoevidence.org. October 2005. Retrieved 2013-07-13. ^ "'Yes, UFOs exist': Position statement by SEPRA head, Jean-Jacques Velasco". Seattle, WA: ufoevidence.org. April 18, 2004 [Originally published in La Dépêche du Midi]. Retrieved 2013-07-13. ^ "Assessment of the UFO phenomenon by GEPAN (1978)". Seattle, WA: ufoevidence.org. Retrieved 2013-07-13. ^ "Ovni-nouvelle-commission-denquete-3AF-PAN (Partie 1)". Dailymotion. Paris: Orange. Retrieved 2014-01-11. ^ "Rapport d'étape de la Commission Sigma/3AF" (PDF). Paris: Association Aéronautique et Astronautique de France. May 31, 2010. Retrieved 2014-01-11. ^ Dini, Luc (January 10, 2013). "Sigma 2". 3AF. Paris: Association Aéronautique et Astronautique de France. Retrieved 2014-01-11. ^ Boudier, Alain (June 20, 2013). "Alexandre – Alain Boudier – Sygma & 3AF". RimLive.com (Interview). Interviewed by Alexandre. Paris. Retrieved 2014-01-11. ^ Lissoni, Alfredo (Autumn 2001). "New Documents 'Will Revolutionize UFOlogy'!". Flying Saucer Review. London: Flying Saucer Service. 46/3: 13–17. ISSN 0015-4881. Retrieved 2013-09-09. ^ "And Ufology UFO Italy UFO sightings, not Flying Saucers, Aliens or Extraterrestrials". Ufo.it. Retrieved October 6, 2014. ^ Pirro, Deirdre (June 17, 2010). "Unexpected fans". The Florentine (125/2010). Florence: The Florentine Group. Retrieved 2013-07-13. ^ Innocenti, Stefano. "Gli UFO nel Lazio". UFO.it (in Italian). Cermenate: Maurizio Verga. Retrieved 2013-07-13. ^ Fiorino, Paolo. "Caselle, 1973". UFO.it (in Italian). Cermenate: Maurizio Verga. Retrieved 2013-05-16. ^ Nattero, Rosalba (2011-06-14). "Il Monte Musiné tra storia, tradizione, UFO e viaggi nel tempo". Shan Newspaper. Retrieved 2014-02-03. ^ "Unidentified Flying Objects" (PDF). The Black Vault. Northridge, CA: John Greenewald. June 1951. DSI/JTIC Report No. 7. Retrieved 2013-09-16. ^ a b "UFO files". Kew: The National Archives. Retrieved 2013-09-10. ^ "Files released on UFO sightings". BBC News. London: BBC. May 14, 2008. Retrieved 2013-05-16. ^ "The truth is out there: Britons 'spotted' UFOs, records say". London. AFP. May 13, 2008. Archived from the original on June 5, 2013. Retrieved May 16, 2013. ^ "Airliner had near miss with UFO". BBC News. London: BBC. October 20, 2008. Retrieved 2013-05-16. ^ Defence Intelligence Staff (December 2000). "Unidentified Aerial Phenomena in the UK Air Defence Region" (PDF). Kew: The National Archives. p. 2. 55/2/00. Archived from the original (PDF) on 2012-10-26. Retrieved 2013-09-10. See also The National Archives site: "Unidentified Aerial Phenomena (UAP) in the UK Air Defence Region" for archived documents. ^ Dearing, Stephanie (December 5, 2009). "Cost-cutting causes British gov't to shut down UFO investigations". Digital Journal. Toronto. Retrieved 2013-05-16. ^ "Churchill 'banned UFO report to avoid mass panic'". London. AFP. August 5, 2010. Retrieved 2013-05-16. ^ "Churchill Ordered UFO Coverup, Documents Suggest". FoxNews.com. New York: Fox Entertainment Group. August 5, 2010. Retrieved 2013-07-13. ^ "Churchill ordered UFO cover-up, National Archives show". BBC News. London: BBC. August 5, 2010. Retrieved 2013-07-13. ^ Isgleas, Daniel (June 7, 2009). "Hay aún 40 casos de ovnis sin explicación". El País (in Spanish). Montevideo: Teledoce. Retrieved 2013-09-10. ^ Sparks, Brad, ed. (October 2, 2009). "Comprehensive Catalog of 1,600 Project BLUE BOOK UFO Unknowns". CUFOS.org. Chicago: Center for UFO Studies. Archived from the original on June 30, 2013. Retrieved July 13, 2013. ^ Herb, Gert; Hynek, J. Allen (May 2006). "The Amateur Astronomer and the UFO Phenomena". International UFO Reporter. Reprint. Chicago: J. Allen Hynek Center for UFO Studies. 30 (3): 14–16. ^ "UFO Sightings Increase 67 Percent In 3 Years, History Channel Investigates Unexplained Aerial Phenomena". Huffington Post. Oath Inc. 26 August 2011. Retrieved 6 December 2017. ^ Radford, Benjamin (16 June 2011). "Sp what's up with the big increase in UFO reports?". NBC News. Retrieved 4 November 2018. ^ Scrivener, Leslie (2 June 2013). "UFO sightings have doubled in Canada: Are there aliens among us?". The Toronto Star. Toronto Star Newspapers Ltd. Retrieved 4 November 2018. ^ Dittman, Geoff. "The Canadian UFO Survey". Canadian UFO Survey. Retrieved 4 November 2018. ^ Collyns, Dan (27 October 2013). "Peru's UFO investigations office to be reopened". The Guardian. Guardian News and Media Limited. Retrieved 4 November 2018. ^ " "Bienvenidos". DINAE. Archived from the original on January 6, 2014. Retrieved 23 February 2014. ^ Copping, Jasper (November 4, 2012). "UFO enthusiasts admit the truth may not be out there after all". The Daily Telegraph. London: Telegraph Media Group. Retrieved 21 November 2013. ^ Duin, Julia (May 11, 2001). "Government is covering up UFO evidence, group says". The Washington Times. Washington, D.C.: News World Communications. Retrieved 2013-09-11. ^ Spavin, Vicky (May 9, 2001). "They're Here; UFO Watchers to Reveal Proof That Aliens Have Visited Earth". The Daily Record. Glasgow: Trinity Mirror. Retrieved 2013-03-10. ^ Raymer, Katelynn; Ruppe, David (May 10, 2001). "Group Calls for Disclosure of UFO Info". ABC News. Retrieved 2013-03-11. ^ Watson, Rob (May 10, 2001). "UFO spotters slam 'US cover-up'". BBC News. London: BBC. Retrieved 2013-09-11. ^ Kehnemui, Sharon (May 10, 2001). "Men in Suits See Aliens as Part of Solution, Not Problem". FoxNews.com. New York: Fox Entertainment Group. Retrieved 2007-05-10. ^ McCullagh, Declan (May 10, 2001). "Ooo-WEE-ooo Fans Come to D.C." Wired News. Waltham, MA: Lycos. Retrieved 2007-05-10. ^ Schmidt, Brad (April 25, 2002). "Alien theorist offers proof of government coverup". Oregon Daily Emerald. Eugene, OR. Retrieved 2012-12-12. ^ Symington, Fife (November 9, 2007). "Symington: I saw a UFO in the Arizona sky". CNN. Atlanta, GA: Turner Broadcasting System. Retrieved 2013-11-25. ^ Schultz, Marisa (April 29, 2013). "Ex-Rep. Kilpatrick 'waiting to hear' evidence of space aliens". The Detroit News. MediaNews Group. Archived from the original on 2013-05-31. Retrieved 2013-09-11. ^ "Citizen Hearing on Disclosure". Citizen Hearing on Disclosure. Bethesda, MD: Paradigm Research Group. Retrieved 2013-09-11. ^ "Physical Evidence Related to UFO Reports - Sturrock Panel - Abstract, Summary and Introduction". Seattle, WA: ufoevidence.org. Retrieved 2013-09-08. ^ "Sturrock Panel". Seattle, WA: ufoevidence.org. Retrieved 2013-09-08. Other links to Sturrock panel. ^ Van Utrecht, Wim. "Triangles over Belgium". Caelestia. Caelestia.be. Retrieved 2013-07-13. ^ "UFO Relics". UFO Hunters. Season 3. Episode 33. May 6, 2009. History. ^ Heaven and hell : a compulsively readable compendium of myth, legend, wisdom, and wit for saints and sinners. Faustino, Mara. New York: Atlantic Monthly Press. 2004. ISBN 0871136961. OCLC 55596198. ^ Krismantari, Ika (February 6, 2011). "Crop circles provide food for thought". The Star. Petaling Jaya: Star Publications. Archived from the original on October 30, 2012. Retrieved September 12, 2013. ^ "Is the Government Hiding Facts On UFOs & Extraterrestrial Life? ; New Roper Poll Reveals that More Than Two-Thirds of Americans Think So" (Press release). New York: Business Wire. October 15, 2002. Retrieved 2013-09-12. ^ "Poll: U.S. hiding knowledge of aliens". CNN. Atlanta, GA: Turner Broadcasting System. June 15, 1997. Retrieved 2013-09-12. ^ Posner, Gary P. (July 1992). "The Gulf Breeze 'UFOs'". Tampa Bay Sounding. Seminole, FL: Tampa Bay Mensa. Retrieved 2013-07-13. ^ "The Roper Poll". Ufology Resource Center. SciFi.com. September 2002. Archived from the original on 2006-07-13. Retrieved 2006-08-19. ^ "UFO Fast Facts". MUFON.com. Cincinnati, OH: Mutual UFO Network, Inc. Archived from the original on 2008-04-30. Retrieved 2013-07-13. Deardorff, J.; Haisch, B.; Maccabee, B.; Puthoff, H. E. (2005). "Inflation-Theory Implications for Extraterrestrial Visitation". Journal of the British Interplanetary Society. London: British Interplanetary Society. 58: 43–50. Bibcode:2005JBIS...58...43D. ISSN 0007-084X. Retrieved 2018-09-21. Latagliata, Rosamaria (2006). UFO: verità o menzogna?. Gli atlanti di Voyager (in Italian). Florence: Giunti Editore. ISBN 978-88-09-04698-6. OCLC 635701671. "Reasons to Believe (a collection of short articles by nine different authors)". New York Magazine. March 19 – April 1, 2018. pp. 25–33. Rose, Bill; Buttler, Tony (2004). Flying Saucer Aircraft. Secret Projects. Hinckley, England: Midland Publishing. ISBN 978-1-85780-233-7. OCLC 99774524. Sheaffer, Robert (1981). The UFO Verdict: Examining the Evidence. Buffalo, NY: Prometheus Books. ISBN 0-87975-146-0. LCCN 80084406. OCLC 7364885. Stanford, Ray (1976). Socorro 'Saucer' in a Pentagon Pantry (1st ed.). Austin, TX: Blueapple Books. ISBN 0-917092-00-7. LCCN 76013768. OCLC 2524239. Sturrock, Peter A.; Holzer, T. E.; Jahn, R.; et al. (1998). "Physical Evidence Related to UFO Reports: The Proceedings of a Workshop Held at the Pocantico Conference Center, Tarrytown, New York, September 29 - October 4, 1997" (PDF). Journal of Scientific Exploration. Stanford, CA: Society for Scientific Exploration. 12 (2): 179–229. ISSN 0892-3310. Archived from the original (PDF) on January 7, 2010. Retrieved September 8, 2013. Sturrock panel report on physical evidence. Vallée, Jacques (2008) [Originally published 1991; New York: Ballantine Books]. Revelations: Alien Contact and Human Deception. San Antonio, TX: Anomalist Books. ISBN 978-1-933665-30-6. LCCN 91091858. OCLC 225866107. Viberti, Pier Giorgio (2010) [Originally published 1997]. Incontri ravvicinati: Avvistamenti e contatti da mondi lontani. Atlanti del sapere (in Italian). Florence: Giunti Editore. ISBN 978-88-09-75032-6. OCLC 800130536. Dolan, Richard M. (2000). UFOs and the National Security State: An Unclassified History, Volume One: 1941–1973 (1st ed.). Rochester, NY: Keyhole Publishing Company. ISBN 0-9677995-0-3. LCCN 00691087. OCLC 45546629. Dolan is a professional historian. Downes, Jonathan; Wright, Nigel (2005). The Rising of the Moon (Revised ed.). Bangor, Northern Ireland: Xiphos Books. ISBN 978-0-9544936-5-3. OCLC 70335856. Keel, John (1996) [Originally published 1970 as UFOs: Operation Trojan Horse; New York: G. P. Putnam's Sons]. Operation Trojan Horse (PDF). Lilburn, GA: IllumiNet Press. ISBN 978-0-9626534-6-9. LCCN 96014564. OCLC 34474485. Archived from the original (PDF) on April 20, 2013. Maccabee, Bruce (2000). UFO FBI Connection: The Secret History of the Government's Cover-Up (1st ed.). St. Paul, MN: Llewellyn Publications. ISBN 1-56718-493-6. LCCN 00028277. OCLC 43634902. Swords, Michael; Powell, Robert; et al. (2012). UFOs and Government: A Historical Inquiry. San Antonio, TX: Anomalist Books. ISBN 978-1-933665-58-0. OCLC 809977863. Haines, Richard F., ed. (1979). UFO Phenomena and the Behavioral Scientist. Metuchen, NJ: Scarecrow Press. ISBN 0-8108-1228-2. LCCN 79014878. OCLC 5008381. Ford, L. H.; Roman, Thomas A. (1996). "Quantum field theory constrains traversable wormhole geometries". Physical Review D. 53 (10): 5496–5507. arXiv:gr-qc/9510071. Bibcode:1996PhRvD..53.5496F. doi:10.1103/PhysRevD.53.5496. Krasnikov, S. (2003). "The quantum inequalities do not forbid spacetime shortcuts". Physical Review D. 67 (10): 104013. arXiv:gr-qc/0207057. Bibcode:2003PhRvD..67j4013K. doi:10.1103/PhysRevD.67.104013. McCampbell, James M. (1987). "Effects of UFOs Upon People" (PDF). In Evans, Hilary; Spencer, John. UFOs, 1947–1987: The 40-year Search for an Explanation (PDF)|format= requires |url= (help). London: Fortean Tomes. ISBN 1-870021-02-9. LCCN 88112852. OCLC 18560737. Retrieved 2013-09-13. Sarfatti, Jack (2006). Super Cosmos: Through Struggles to the Stars. Indianapolis, IN: AuthorHouse. ISBN 978-1-4184-7662-5. LCCN 2004095148. OCLC 70962499. Sheaffer, Robert (2012) [Originally published 2011]. Psychic Vibrations: Skeptical Giggles from the Skeptical Inquirer (2nd ed.). Charleston, SC: CreateSpace. ISBN 978-1-4636-0157-7. Retrieved 2013-07-13.